This dual-blade height-adjustable fan is extremely unique because of its ability to oscillate both horizontally and vertically at the same time. It also offers an exclusive setting to randomly change air speed settings to give a more natural breeze indoors. 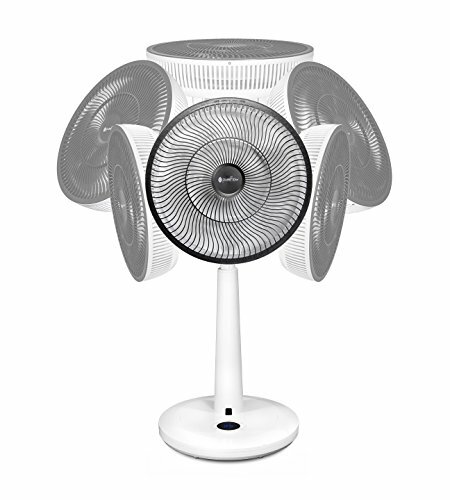 Its telescoping stand turns the fan from a pedestal fan to a table fan with the touch of one button. Dual blades offer a more powerful airflow to cool your room during the warmer months and push warm air from the ceiling down to your living space during the colder months. Operating with peak energy efficiency, this fan will have you comfortable and relaxed in any indoor setting. GreenTech Environmental offers a full range of healthy living products and technologies to help you live a happier healthier lifestyle at home, work, and everything in between. REMARKABLE MOVEMENT THAT GOES IN ALL DIRECTIONS: Simultaneous 90º horizontal and 105º vertical oscillation. INCREDIBLY POWERFUL: The double structure fan blade produces two different airspeeds that rotate together to form a strong air stream that can reach as far as 40 feet. THE COMFORT OF AN OUTDOOR BREEZE: Nature Mode will randomly cycle through different speed settings to create a more natural environment in your room. SILENT OPERATION: Use Quiet Mode while you sleep for operation so quiet you'll wonder if the fan is even on. SUPER CONVENIENT: 11 height settings and an included remote make this fan convenient for use in all rooms. View More In Household Fans. If you have any questions about this product by GreenTech Environmental, contact us by completing and submitting the form below. If you are looking for a specif part number, please include it with your message.